Sarah Minor: "Who told you to get on the bus?" Well, we had yet another school trip where we get on a bus and herded here and there by professors, tour guides and other knowledgeable people of London. This time we went to Bath and Lacock but if you blinked you missed Lacock. We spent almost no time in Lacock which really we only needed another hour and we could have seen everything. 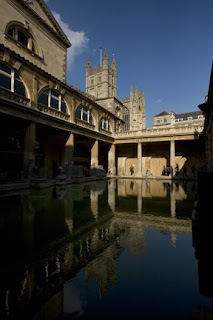 Then we headed to Bath where we were instructed to shoot a "photo story" which was more like find a subject and shoot it for about 30-40 minutes. 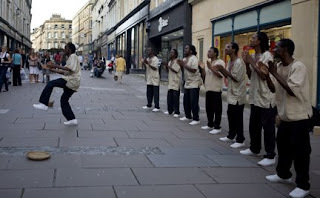 My "photo story" was a group of musicians from Zimbabwe on tour who were performing in a mall like area. Nothing great was shot and felt like more of a waste of time, sorry David. We did get tickets to the Bath. The way it is set up I felt like I couldn't tell where I was in relationship to the actual water of the bath and there was so much modern construction in the "preservation" that is was not very cool at all. I just wish they would keep stuff they way they are and not add so much modern stuff to it. 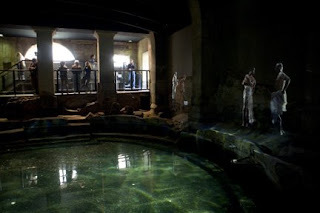 I think Dave said it best, "If the romans knew that their Baths had become a shopping mall..." I don't really need a projection and fake audio of people bathing as seen in a picture above with the people in white with towels. 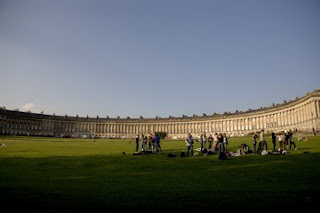 The one place I did like in Bath was the Royal Cresent. The building was kind of neat but the best part was the park in front of it. It was quiet and not a zillion tourist. I sat there for a while watching a football match between some teenagers and people watching. That was the highlight of the day for me I would have to say. I don't know if that is good or bad.